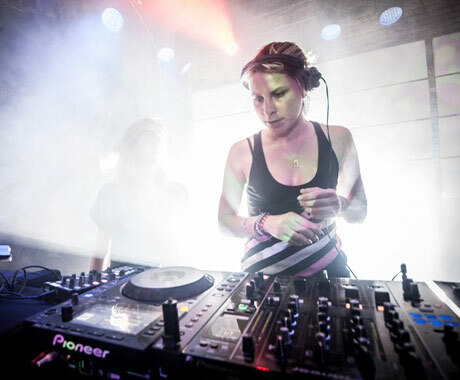 Despite starting later than originally scheduled, London-based Canadian duo Blond:ish took over the post-Cube after-party and turned in a two-and-a-half-hour master class in tripped out tech-house and tightly-wrung techno. Backed by an impressive 12-panel screen (whose visuals never distracted from the music), Anstascia and Vivie-Ann's all-absorbing set had the packed room mesmerized as the duo's bold mixture of textures, disembodied vocal samples and meaty rhythms had the dance floor spilling out to all corners of the club, including the lines for the bathroom and patio. Just when you thought they had brought the hot and sticky room to a boiling point, they ratcheted up the intensity and kept the eager audience begging for more. Playing well past the official close of 3 a.m., the last 25 minutes of their set may have been the best part of the night, with a remix of Tiga's "Plush" pushing the crowd to the edge and back. After such a dynamic and stirring set that had so many unrecognizable yet instantly appealing tracks, it's hard to imagine how anyone else will top the duo's performance this weekend.